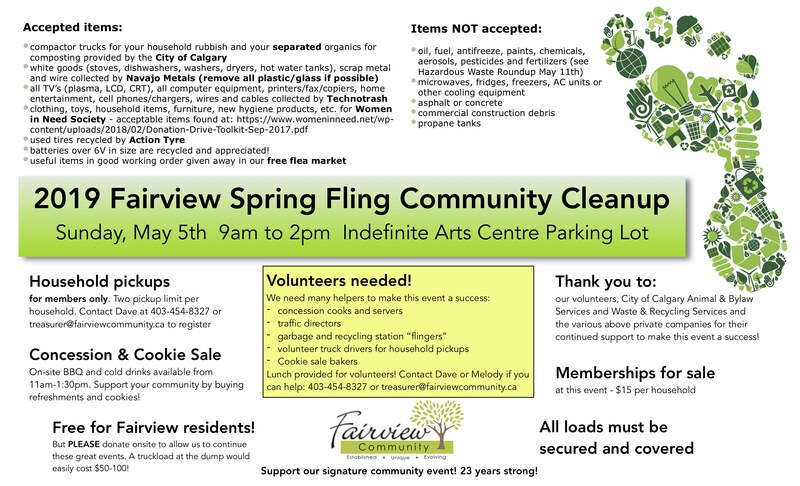 You are here: Home / Events / Fairview Residents: Spring Fling Community Cleanup, Sunday May 5th! 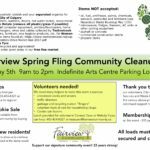 Fairview Residents: Spring Fling Community Cleanup, Sunday May 5th! Fairview residents, come get rid of your junk at our very popular annual cleanup event! Offload your garbage, organics, metals, electronic waste, used tires, large batteries and reusable household items! And come grab a lunch or support our cookie sale at our concession stand! Please make a donation on-site to ensure we can continue running our great programs and events – a trip to the dump would cost over $50! Want to volunteer? We’ve got a job for nearly everyone! We need traffic directors, sorters, “fling”ers, concession staff, cookie bakers! Contact our coordinators, Dave or Melody, at 403-454-8327 or email treasurer@fairviewcommunity.ca if you can help! Lunch is provided for all volunteers. Need to register for a pickup? You must be a member, two trips maximum. Contact our pickup coordinator, Dave, at 403-454-8327 or email treasurer@fairviewcommunity.ca if you need pickup. Special thanks to the City of Calgary for supporting this event. Thanks to Navajo Metals, Technotrash, Women In Need Society, Action Tyre for their contributions to the event as well as In-Definite Arts for providing the use of their parking lot!